Karela Bitter Gourd “Margose” is a delicious simple to cook recipe that is one of the most nutritious vegetables. I have always loved this vegetable/fruit since I was little. I love it any kind of dishes whether stir fried, curried, vindaye spices. Bitter gourd or Karela may not be the favourite of many people because of it’s bitter taste. However over centuries this fruit /vegetable has been one of the main ingredients in many medicinal recipes and therapeutic treatments. It is packed with some key nutrients and healthy components, making it a very healthy addition to your diet. The secret of all it’s good properties lies in the bitterness, it is loaded with medicinal values. The more I read about this vegetable the more I am fascinated to find out about these benefits of this humble fruit/vegetable. Some of its benefits include maintaining balanced digestive system, improve immune system, good to treat and balance diabetes, aid weight loss, and good for eye sight and with its high antioxidant content it’s a great ingredient to keep you look radiant and beautiful. 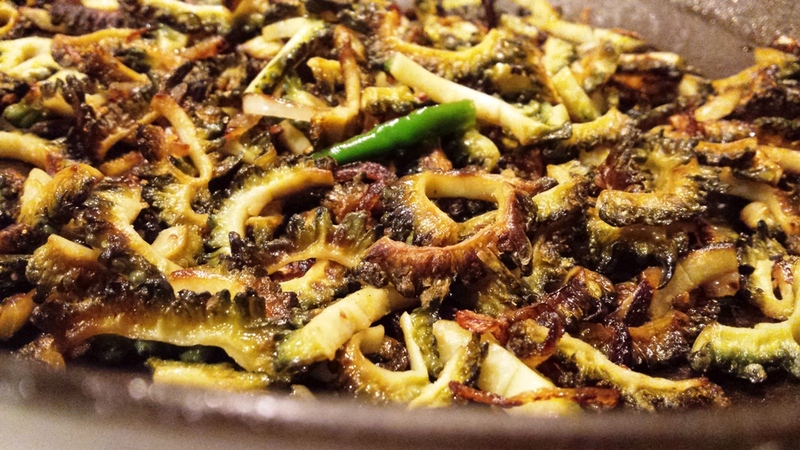 I am definitely keeping Karela in my diet for sure, and believe me with all of these good reasons I am certain one can overlook its bitter taste and consider eating it. Start by preparing the Karela, wash them, cut in half lengthwise remove the seeds and slice into ½ inch pieces. Place in a bowl, add some salt, cover and leave aside. You can do this and leave it overnight otherwise leave for up to one hour. The purpose of doing this, think of chemistry higher concentrated component attract lower concentrated component in this case the salt helps to extracts the water content from the Karela. 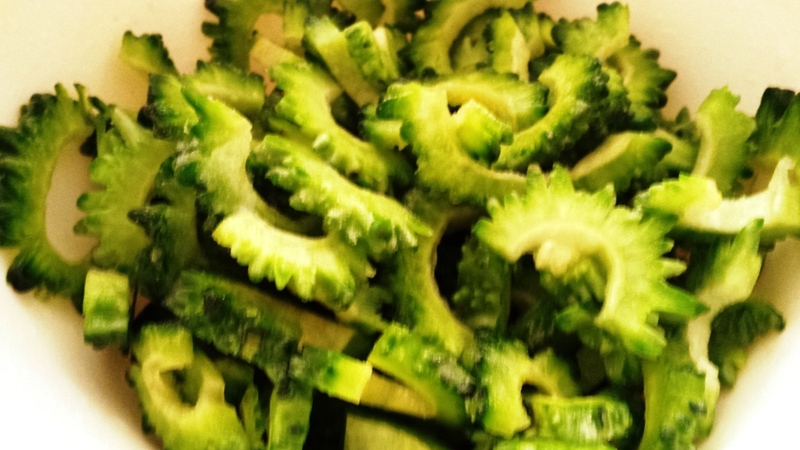 This leaves the Karela with lower water content so when you fry them they are crispy. Squeeze all the water from the Karela and place them on a kitchen towel to dry them completely. Heat the oil in a deep non-stick pan or skittle, add the onions and sauté on a medium flame for 1 to 2 minutes. 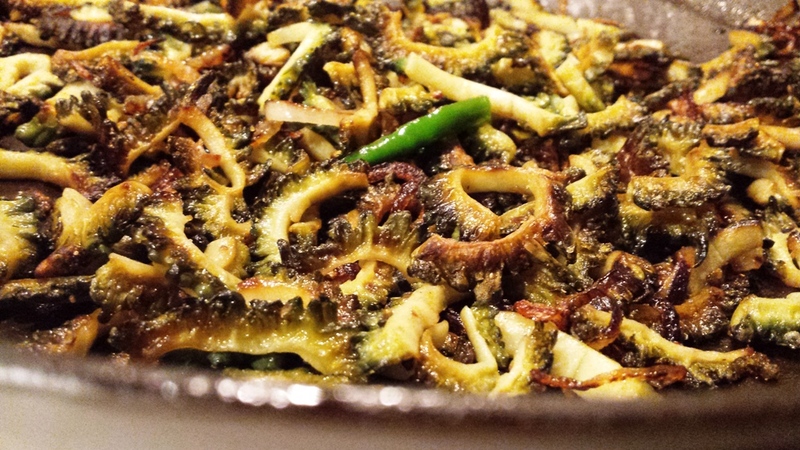 Add the Karela, mix well and cook on a slow flame for 15 minutes, while stirring occasionally. Sprinkle with some garlic salt, jaggery or sugar if using mix well and cook on a medium flame for 2 minutes, while stirring occasionally and getting them golden and crispy. Scatter the sliced chillies. Serve warm and crispy as a side dish accompaniment with boiled rice. Brinda’s Note: This is a Gluten free dish, high in fibre and low in cholesterol.